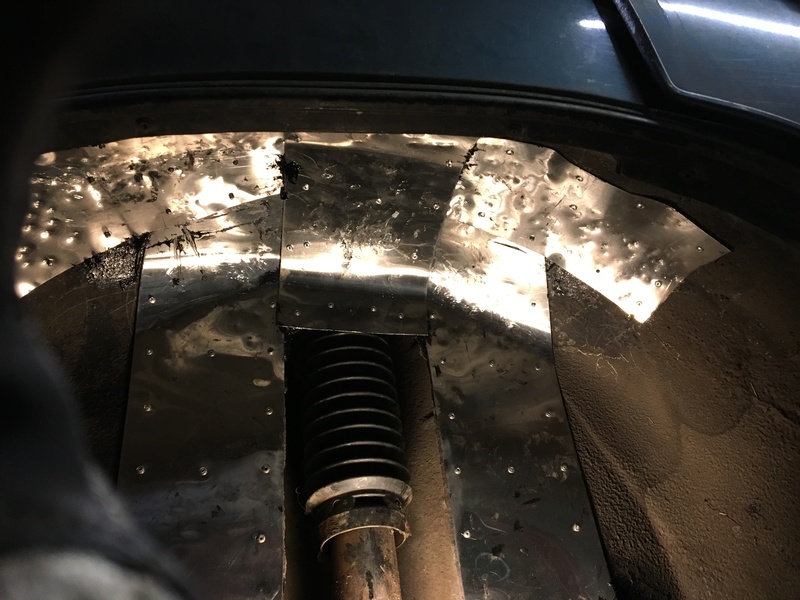 JB welded that sucker in just like everyone else would have done. 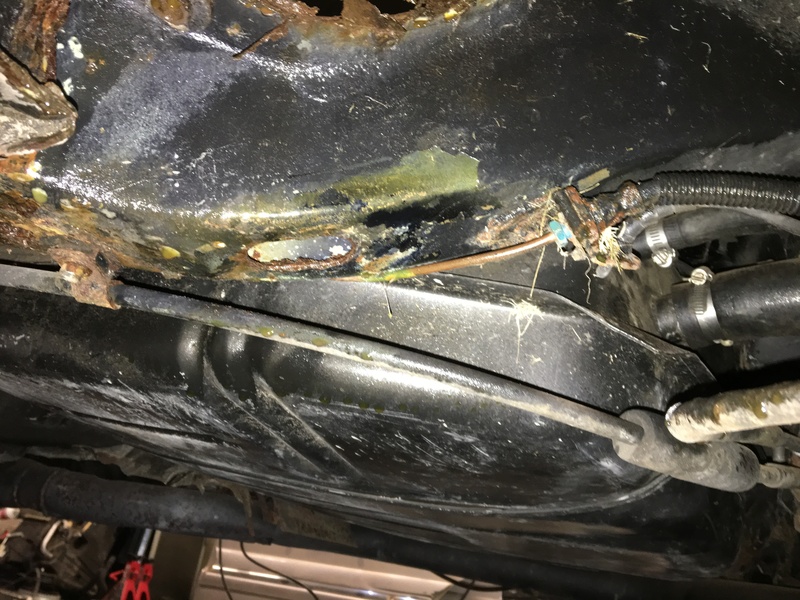 You'll notice in photo #2 above that I cut a ridge in it to give the JB weld something to grab on to, the clip is to make sure it stays seated while it sets up as well as just extra insurance that it's going to stay in place. 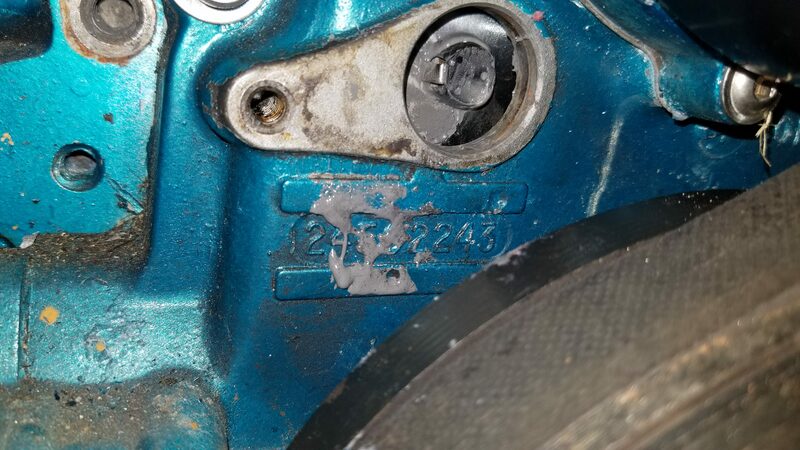 I nearly filled the hole in the cam sprocket with the stuff to make sure it would have to squeeze out to get the magnet back in, wanted to make sure I give it a fair shot at having a strong physical/mechanical grip on the magnet as opposed to relying on it sticking to it. 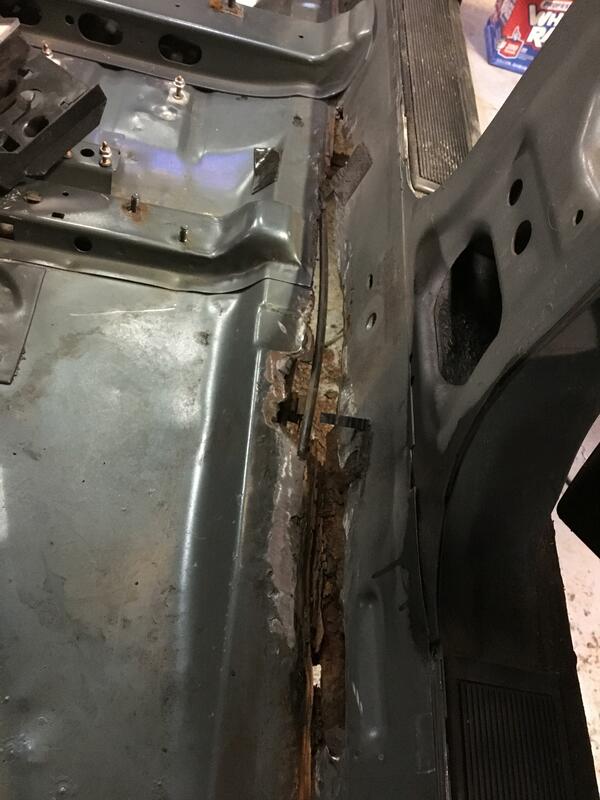 The JB weld fix worked, in that it cleared up the code. But suddenly now I don't have any fuel pressure. Sending unit is new, pump is new, pump turns on as if it were working properly, and gas gauge reads half a tank. 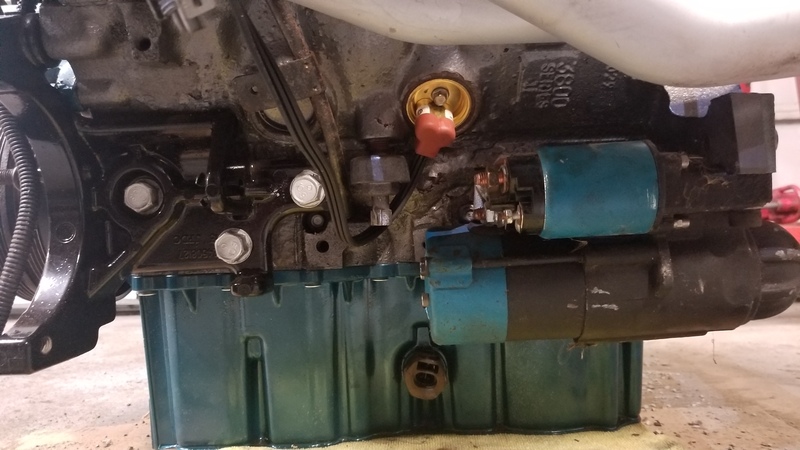 Haven't dug into this yet, but either the fuel pump is junk or the sending unit is junk or something else happened to the gauge that was working just fine before I changed out the rusty sending unit. Pulled the rubber hose from the fuel filler and put my boroscope in the tank yesterday. So it looks like the sending unit or gauge is bad. For now I'm going to throw some gas in it and move along. I'll measure the resistance of the sensor before and after so I know if the sensor is working or not and go from there. Basically all set here finally! I'll put a used alternator on it until I fix the issue with the one I powdercoated, ignore the failed fuel gauge issue for now, sort out the alignment and plates/insurance, and start driving it in the next few days to hopefully flush out any remaining issues. Ok... Well, I had some fun with this car. Spoiler alert: Something in the bottom end went after driving it a grand total of 30 minutes. So after I fixed the issue with the cam magnet, I was still having hard starting. As in, it just wouldn't even start. Cue the boroscope, compression tester, fuel injector tests, etc. Nothing. Check the coils, all good and making hot spark. Checked the new wires for arcing or anything, nada. Checked over the ICM harness, went back and re-traced every wire in the C101 firewall pass-through (hey, I missed the power wire for the trans, so maybe it was something else). Nothing wrong there either. New computer, nope. Pulled the spark plugs, they were wet, confirming that I have fuel but no spark. Cleaned them, reinstalled, nope nope nope... Went over MAS, MAP, TPS, ECT, every sensor on the scanner - everything is working like it should be. 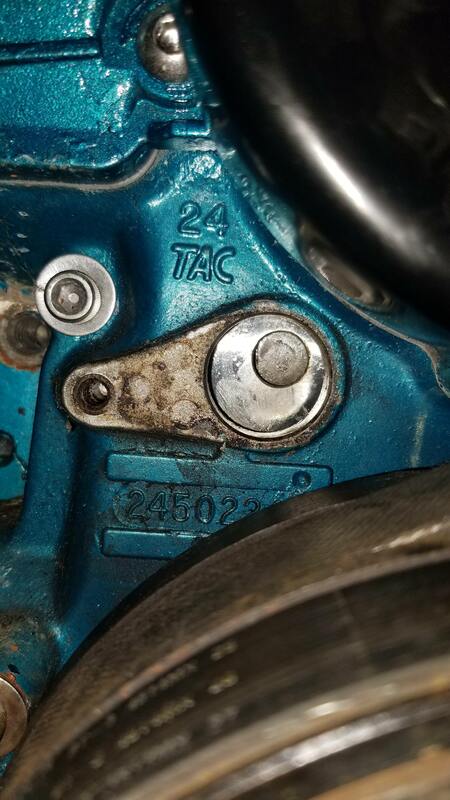 Pulled the balancer, put a new crank and cam sensor on it, put it all back again..... yeah, nope. Took a short break from it (taking classes for my masters, so that eats up some of my time and focus). Came back, and decided to throw a new set of good 'ol cheap AC Delco copper plugs on it. Fires right up! So I'm left scratching my head at trying to figure out why this set of plugs (iridium plugs I'd had in the SSEi that were working fine that I saved when I went turbo) decided to be junk. But whatever, it runs now, so I can finally do something with it! First day, I let it get up to temp and drive it around, chase some of the suspension creaking, change the front wheels, etc. After it's warmed up the oil pressure drops a bit low, and suddenly it's stalling at idle... Let it cool off, and pressure is back up to 65psi and idles fine. Warmed up, it dropped to 20 and dies at idle. Pull the dipstick to find that the brand new oil is now overfilled by about 1 quart, and it smells like gas. 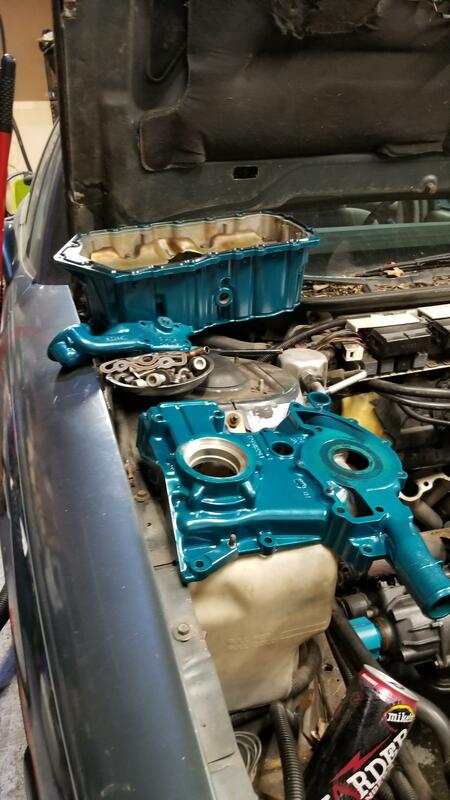 I figured at this point the motor was done for, but I changed the oil anyway. Initial testing revealed solid oil pressure again, running smooth, no issues. 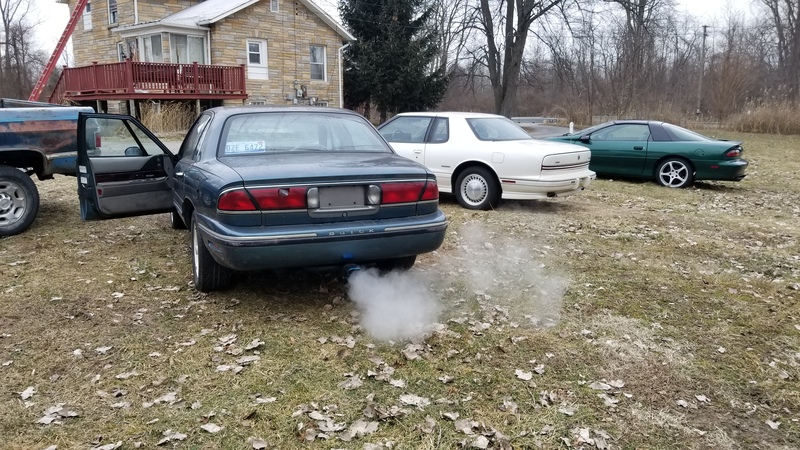 So now that it's running, the oil pressure is good, and it sounds like it's happy, I decided to take it out for a cruise and do some running around, see how it's driving. Found that the trans seems to be working, which is good. It makes great power considering it's just a stock pulley, and I tell you what, the suspension and brakes are better than I'd expected! I was acutally thinking it was good to go after all this time! About 30 minutes into the drive the oil pressure started dropping again, and of course it started struggling to idle. So I pulled off the road, shut it off, and checked the oil. Between the gas-filled oil change and this one, something gave out inside. The oil had some really really big flakes in it compared to the last time I had a bearing go; and the brand new oil was black already. So the car got towed home, and I parked it. Until last night anyway. I started pulling the motor, discovered that the coolant was brown and smelled a lot like either rotten old oil or something else similar. There's a lot of heavy particulates in the cooling system, the bottoms of all the hoses and everything have a thick layer of brown goo. So much for saving the new coolant... I've got all the fluids draining now, going to finish that up tonight and get the motor out. 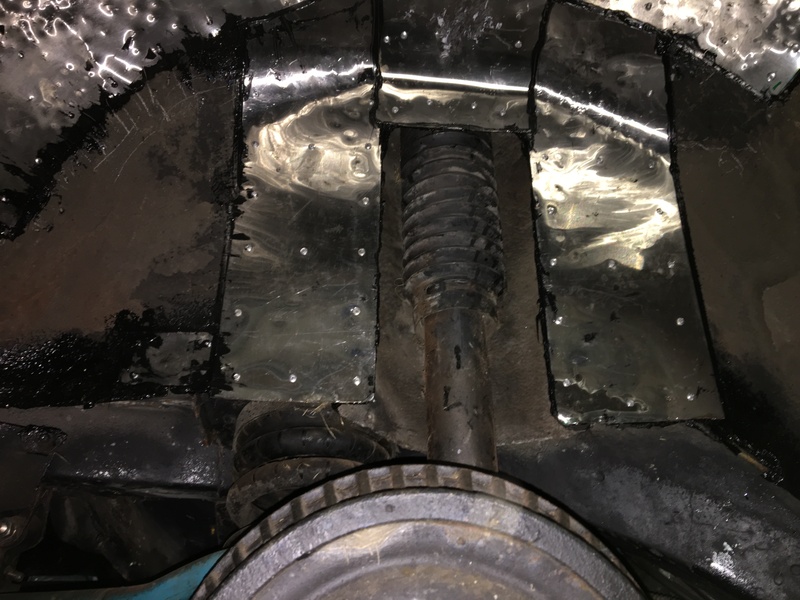 Plan is to hit up the local u-pull for a new bottom end from a series 3 car (NA or SC, doesn't matter anymore) and toss the shortblock in. This was supposed to be my winter car this year, thankfully we've not really had any winter weather yet.. I'll be saving the motor for the moment. I want to see what the failure was. 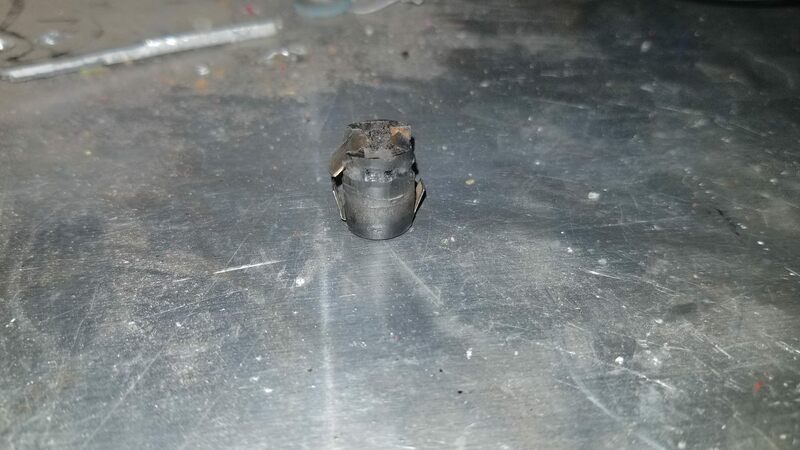 I'm guessing it was a main bearing. 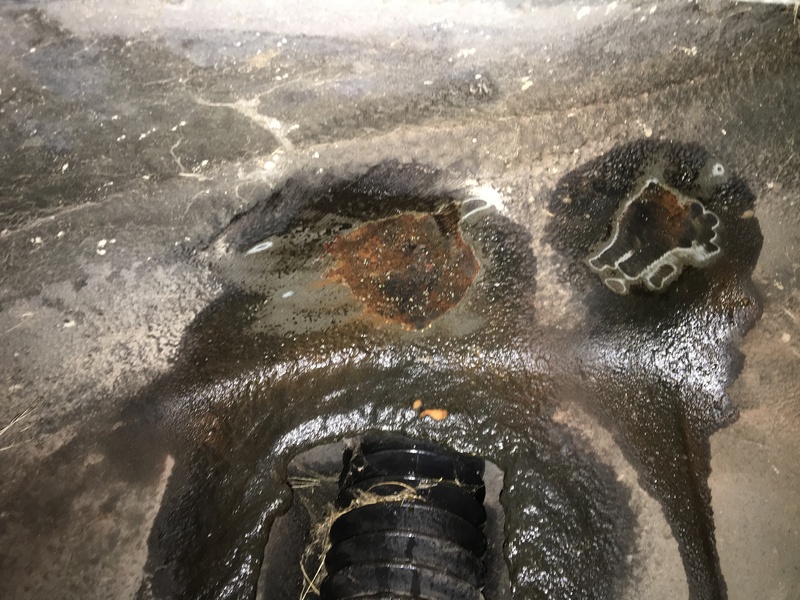 I have another L67 block with a good bottom end that had a cam bearing failure. Perhaps between the two I can end up with one solid bottom end? But hopefully this time it's a simple R&R, and go. 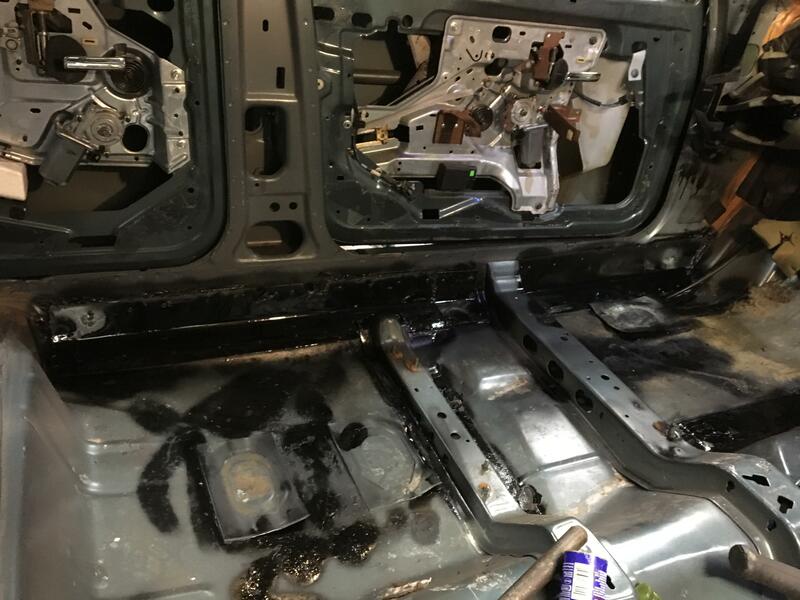 Oh, and the interior needs some deep cleaning. The only other thing I want to do is adjust the shift kit, and check to make sure there are no surprises in the pan. If there are, well, at least I have a built up backup unit to toss in. But for some reason, the *shoot* never ends with this car. 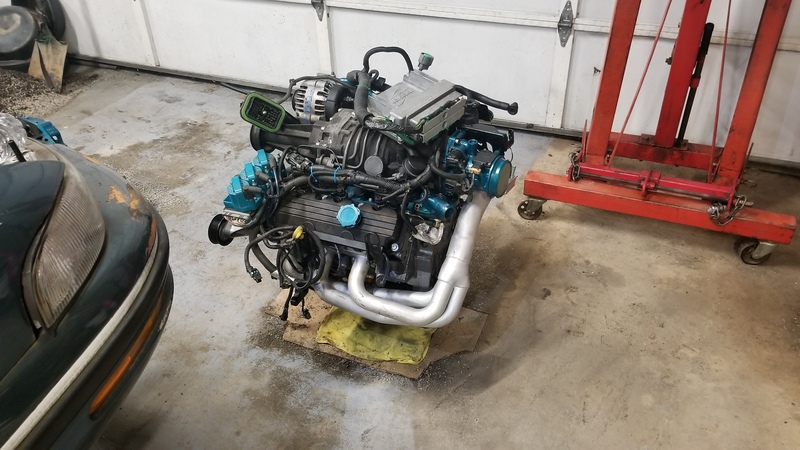 And the engine is out! I think I might go ahead and powdercoat a few more things while I have it all apart. Should be the ideal time, the cold means there's like 0% humidity, so aside from been freezing cold out it might actually work? 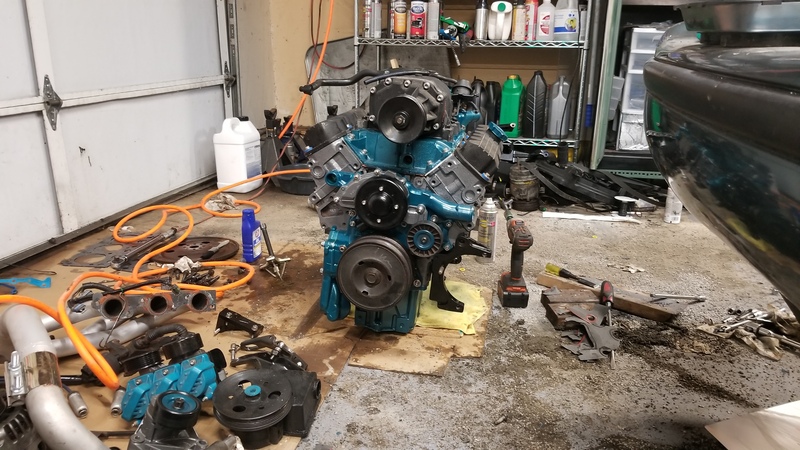 Got the old motor stripped down, figured out it lost a rod bearing, oddly there were no knocking noises at all. So yeah, awesome! And we're just about ready again again again! I should have everything wrapped up tonight, I think, except the flywheel. 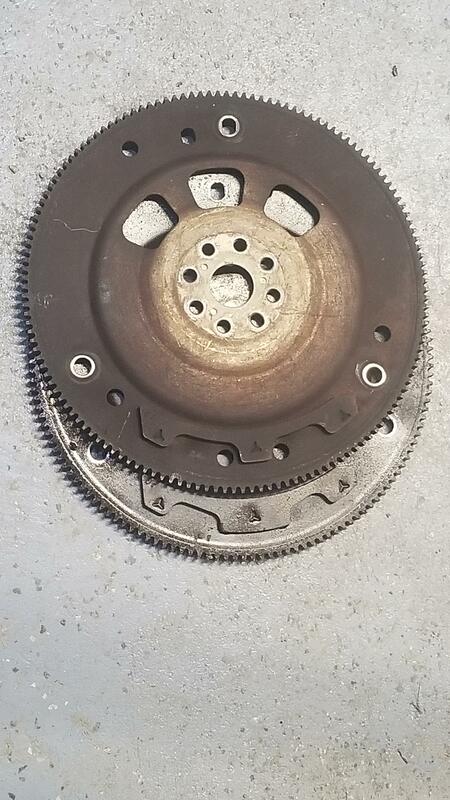 The NA Camaro flywheel (which is what this new motor is from) is different than the FWD NA flywheel. So far, I've taken up and down the road a bit to work out some final little issues. I found that one of the coolant elbows might have a nicked O-ring, so I'll have to replace it. Then I have an issue with the trans and delayed shifting that might be due to a bad TPS. But other than that, it runs, it doesn't overheat, it holds good oil pressure! Once I get those little details fixed, I'll have to do a deep cleaning and get some driving videos. More to come! Looks awesome! Can't wait to hear the exhaust. I've decided that this car project is never going to end! 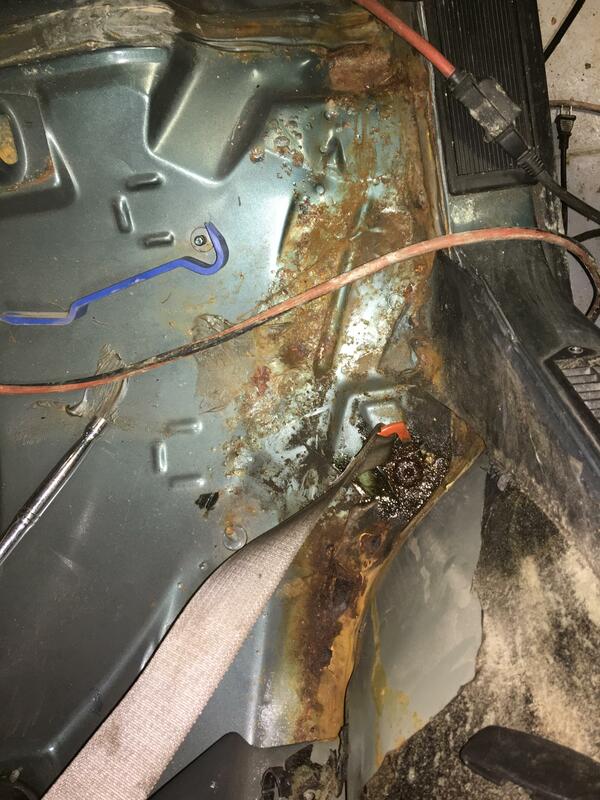 Found me a parts car with a fully loaded tan leather interior, and have the car mostly stripped down already. Funny story about this one... they were selling it because the subframe let go. 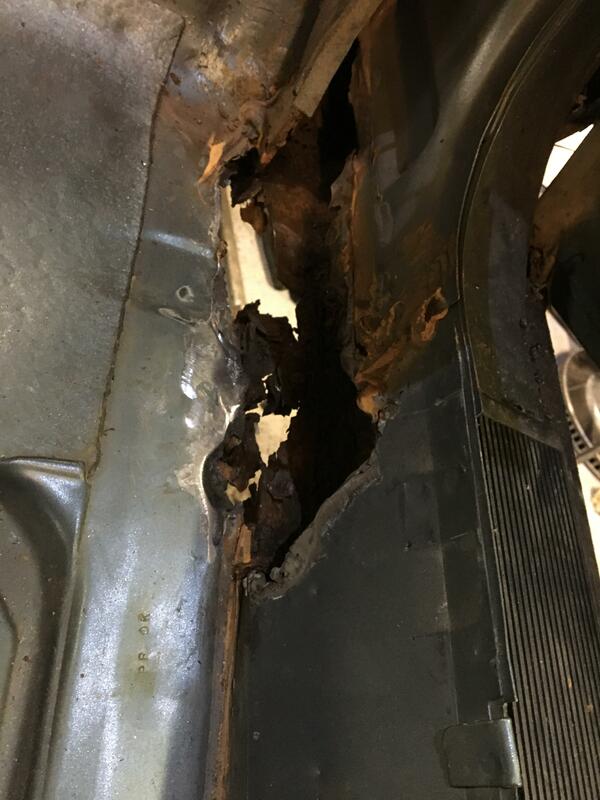 The reason they stopped driving the car was because the subframe let go... 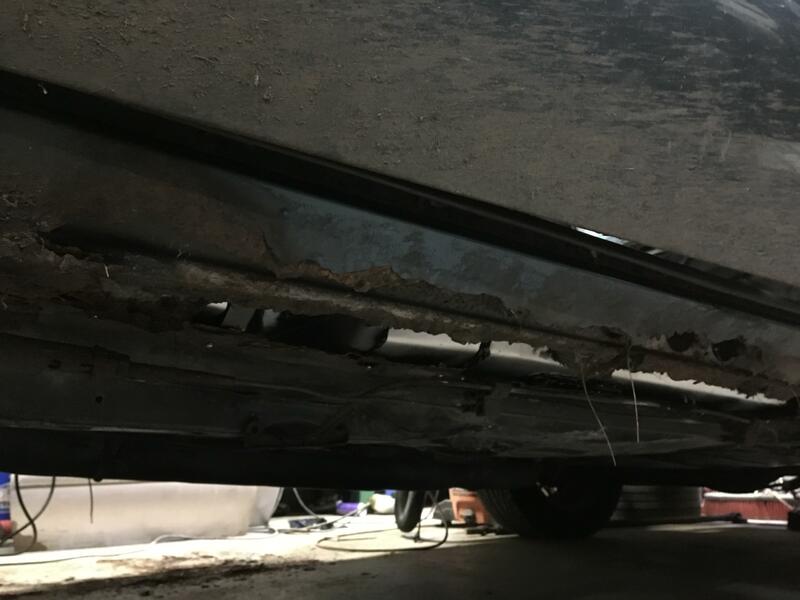 It had a massive fuel leak, only the right rear brake worked, and the rear end was one pothole away from the car folding in half. It took me a while to process the fact that they had been daily driving this car without front brakes. Anyhow, aside from a few clips breaking and some funky smell from the trunk, the interior just needs to be cleaned up a bit. The only things I'll need to get from a salvage yard are the armrest lid and the right rear seatbelt. One little gripe I have is that the HVAC module comes out through the engine bay - and I want that fancy dual climate control! So that means that I have an excuse to pull the trans again and switch it out for my built-up one. I am so glad my LeSabre is nowhere near that bad. At least that is just a parts car. Kind of intrigued on seeing the dual climate control install, as that's something I've been interested in doing to mine. Looks like the dual climate deal is a full on body harness swap. 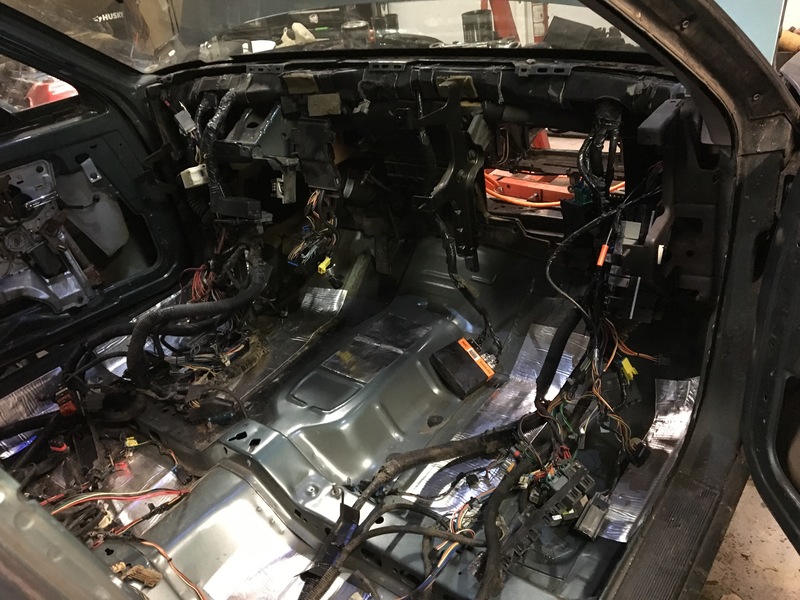 I've had to strip the interior down, remove everything under the dash, etc. It's a bigger job than I realized, especially considering how fragile all the silly plastic covers are on the outside of the HVAC unit. 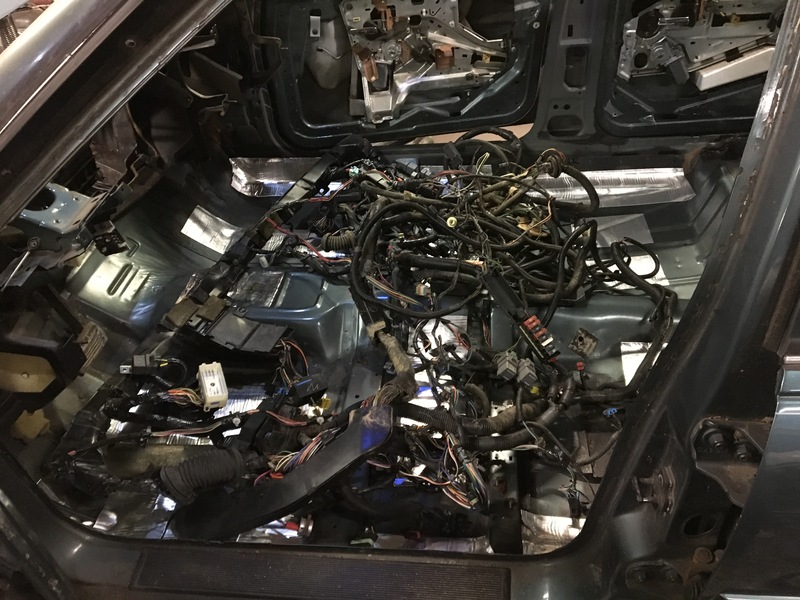 Having spent a lot of time around automotive assembly lines, I'm surprised at how difficult some of this is. 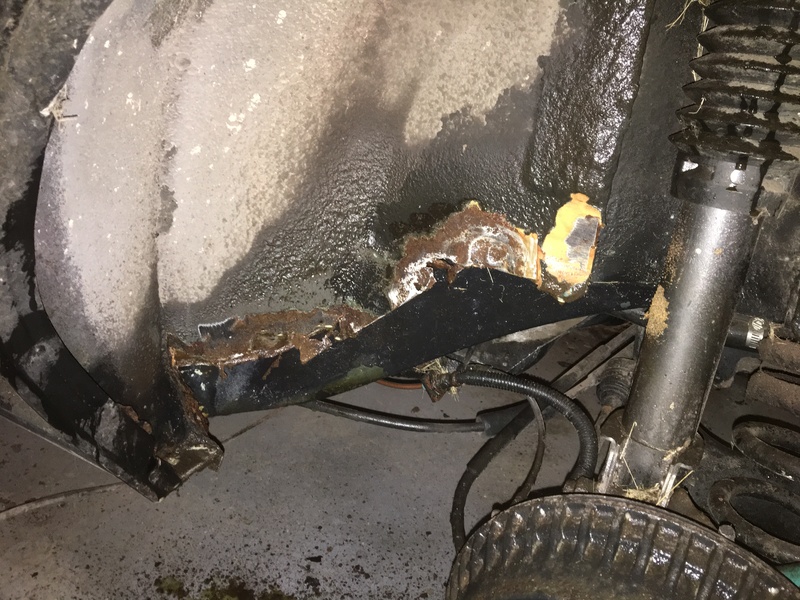 Getting into some of the little details here, I figured that I'll have to do more cut and weld than I'd intended to fix a hole I found in the wheel well. I have to cut good metal out just to get to it. 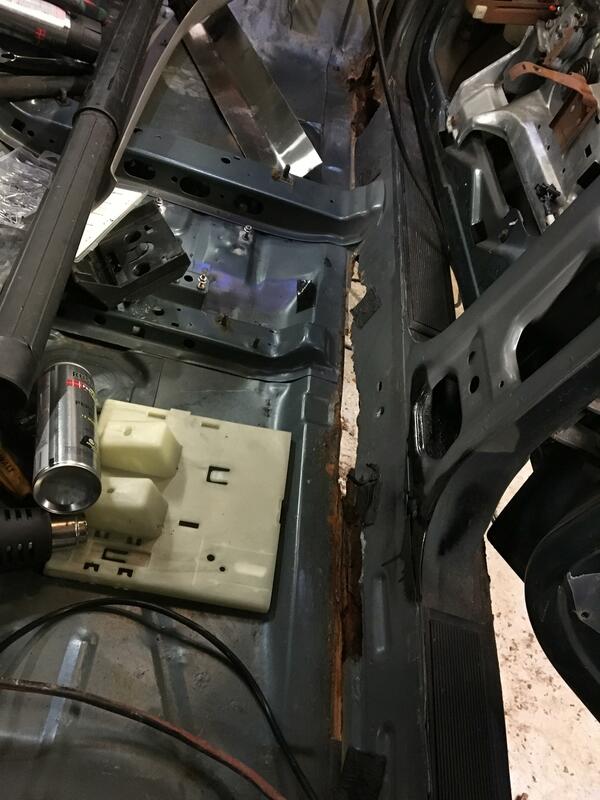 Of course, the goal is going to be to stop the rust, then rivet and/or weld patch panels in and seal them. I really should just re-do all the rockers. I was holding off on that level of surgery because I wasn't sure just how much I wanted to put into this car. 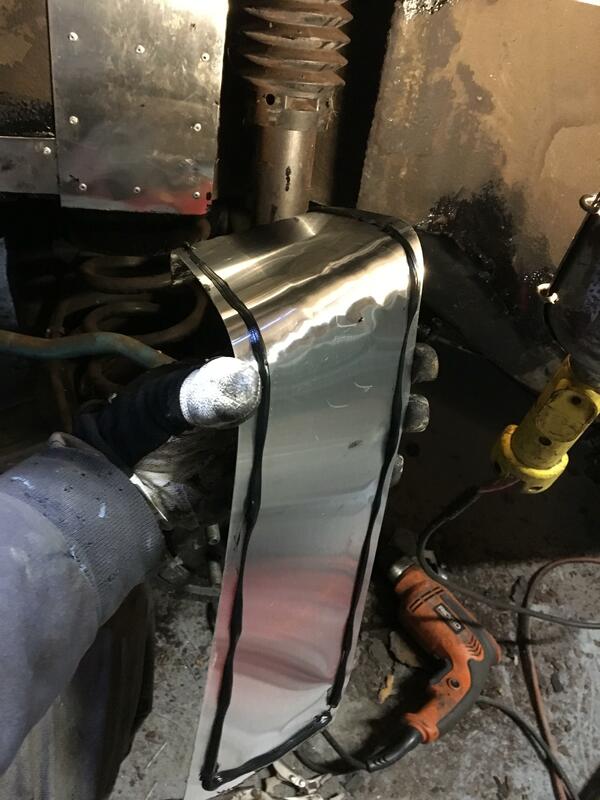 But then I found a bunch of strips of stainless at the local recycler, and combined with my brother's new DIY metal brake I can make the bends all the same, clean, etc. But that would mean I'll have to rivet it together. I guess at this point, a few rivets along the bottom are going to still look better than gaping rust holes. 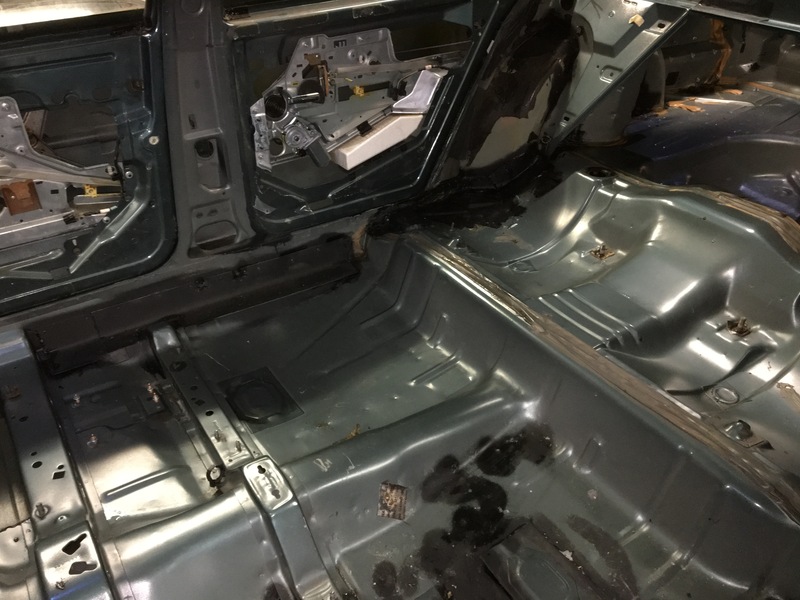 I'll also need to do just a little work on the new interior, mostly cleaning it but some plastic repairs and improvements like wrapping the pillars and redoing the headliner in faux suede... There were some small squeak and rattles that I want to silence while it's all in pieces. I find this one annoying. The drivers side is pristine. Such is life in the salt belt I guess. This was mostly what looked like surface rust. 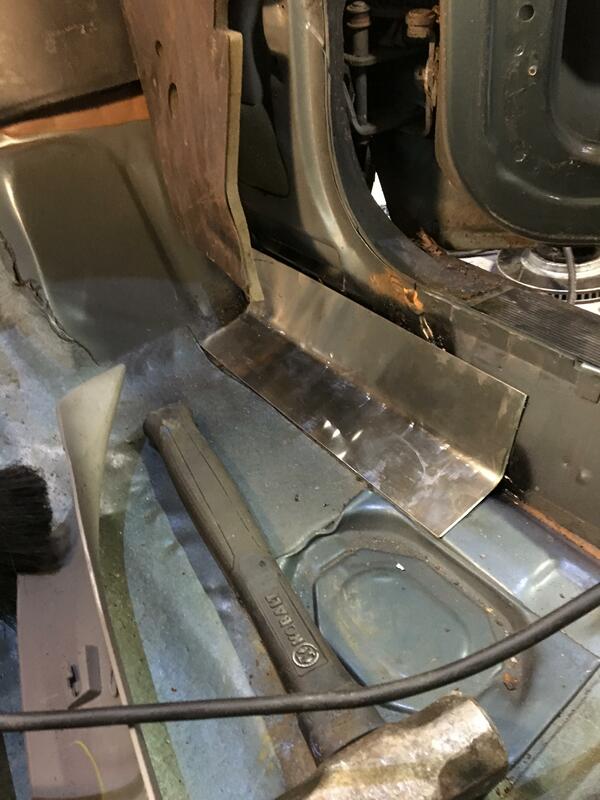 When I pulled the interior it was water logged at the rockers so I figured that it was pinholed. Nope, it was straight up hit it with a hammer and watch it disappear!!!! Again, I'm not doing this job ever again, and I don't want to ruin the new interior, so it's got to be fixed. I haven't decided if I'm going to do anything about the outer rocker yet, it has to be welded and body filled to really hide the repair, and I'm kinda thinking of leaving it plainly obvious just to add to the troll factor. 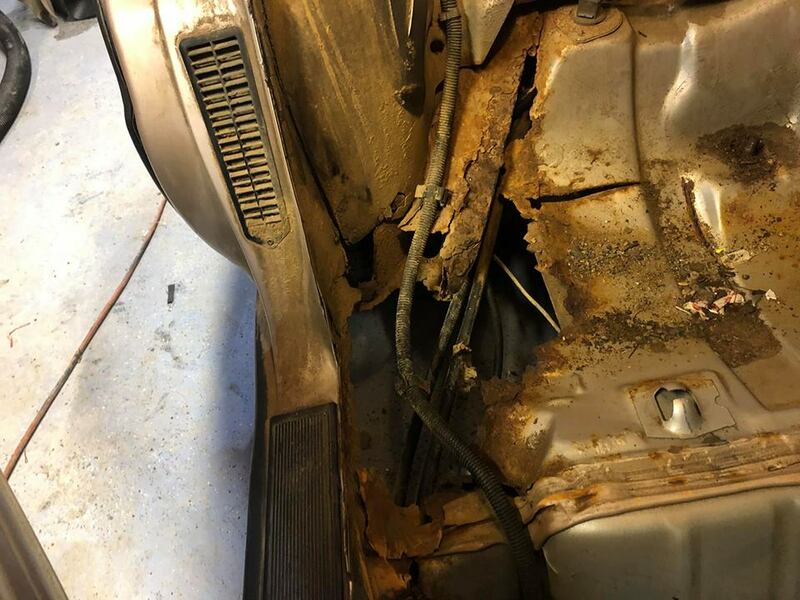 Ok, I know you have a budget and I know you don't mind work...but if I tore into a car like this it would be an immediate decision to scrap it. There has to be better donor shells out there that are cheap. If you got t-boned on that b-pillar area, your passenger wouldn't be feeling well. Matt, what sort of sealant did you use? Would you mind taking some more up close pics of the repair, around the seams, etc. Greg and I are working on a similar project. I'm in this for a winter beater, once I started poking around this car I realized that's all it's going to be good for. Something I can plop $40 into some metal, rivets, and welding materials, and not be out a few grand (or really care about it) if it gets wrecked, and still have a pile of good parts for the next one, and hopefully last me more than just 3 winters like the last one did. Certainly no way I could justify trying to 'fix' it like this and flip it. 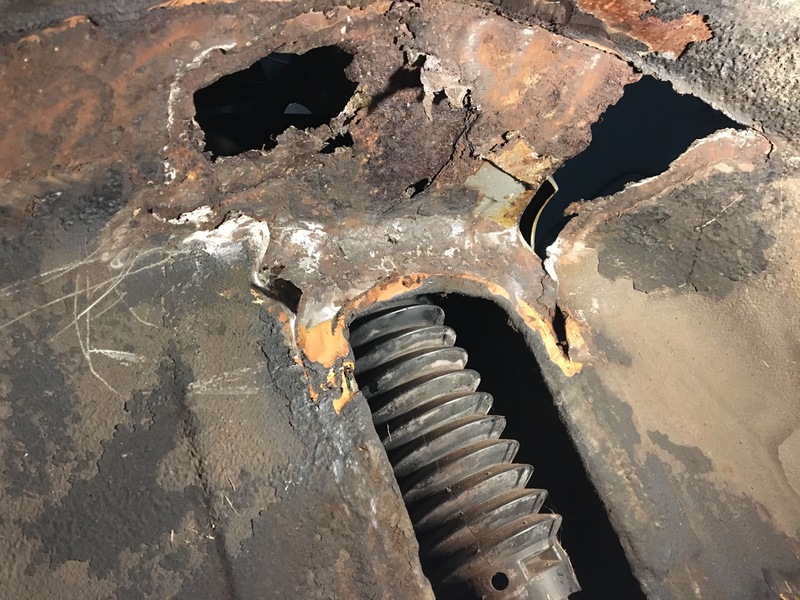 The rails that the seat frame bolt to, and the structure inside the seat frame, are the primary side impact countermeasure for first row. 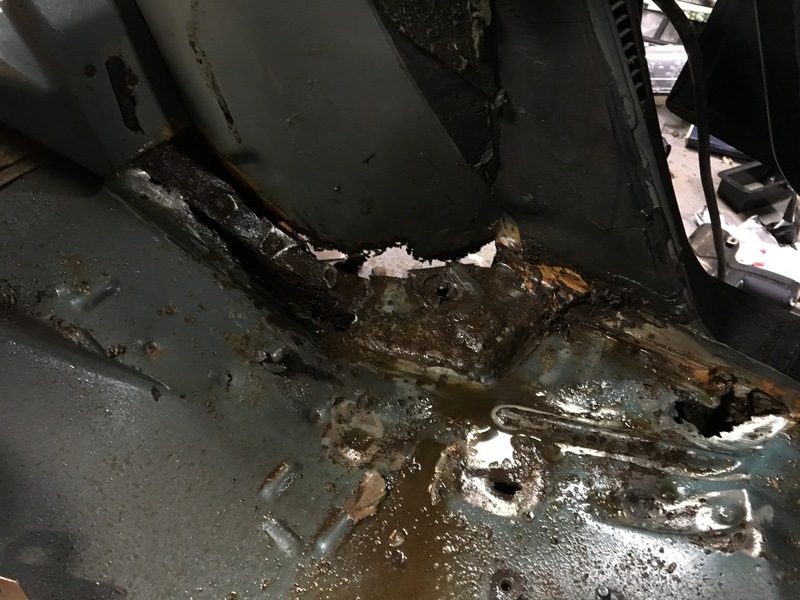 The doors have more to do with passenger compartment intrusion and side impact performance than the rocker does. I'm not saying it's not a factor, but I'd rather rip out something that is questionable and put new metal as opposed to leave it as is, coat it with POR-15 and pretend it's fine. 98% of my driving is either alone in my daily, or with the wife/kid in the STS. The only time I would have a passenger in my daily is for the one-off weekend junkyard excursion. Could I find a donor shell that's better? I've been down this road. Either it's not cheap, or it's not coming from the salt belt, within 50 miles of a coastline, east of the Appalachians, etc, they are all rotted out. It turns into a weekend excursion with a truck and trailer and $500 in gas. If I'm going to that trouble I'm not getting a winter beater anymore. Tim - Loctite PL-S30. Its a polyurethane adhesive sealant, ozone and UV resistant, paintable, permanently flexible etc. Because Tim asked, here's a kind of step-by-step. 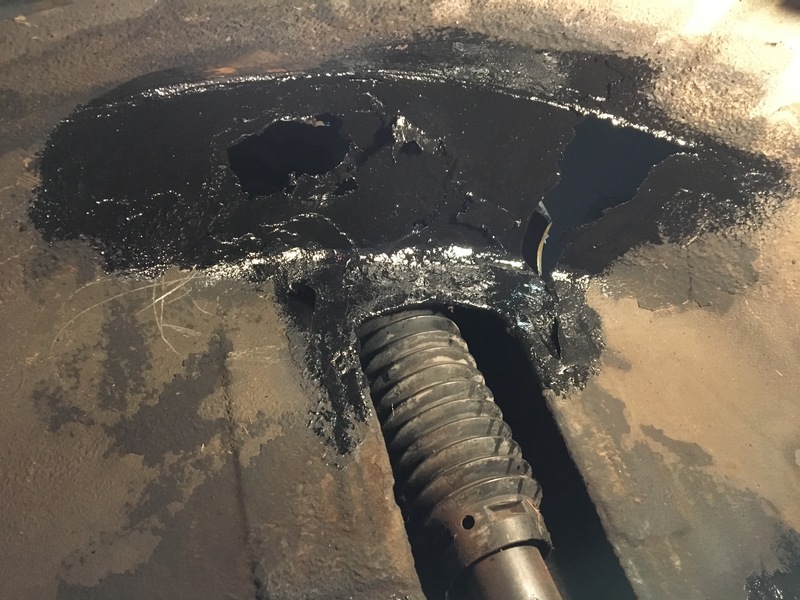 At first glance, it looks like it only rotted through in the one hole. That rust dust gets everywhere... 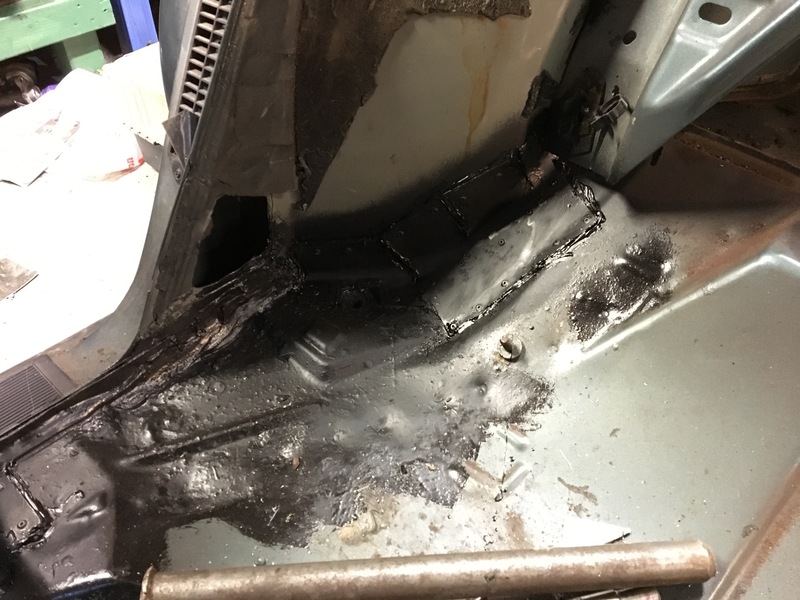 I let some evaporust soak into the exposed seams overnight, rinsed it off and sealed the metal that was thick enough to survive the flap sander with POR-15. The point is to simply stop the progression. Then I went back over all the joints, wiping the sealant that oozed and adding more where needed. I will probably go back over it all again just to be sure everything is sealed. 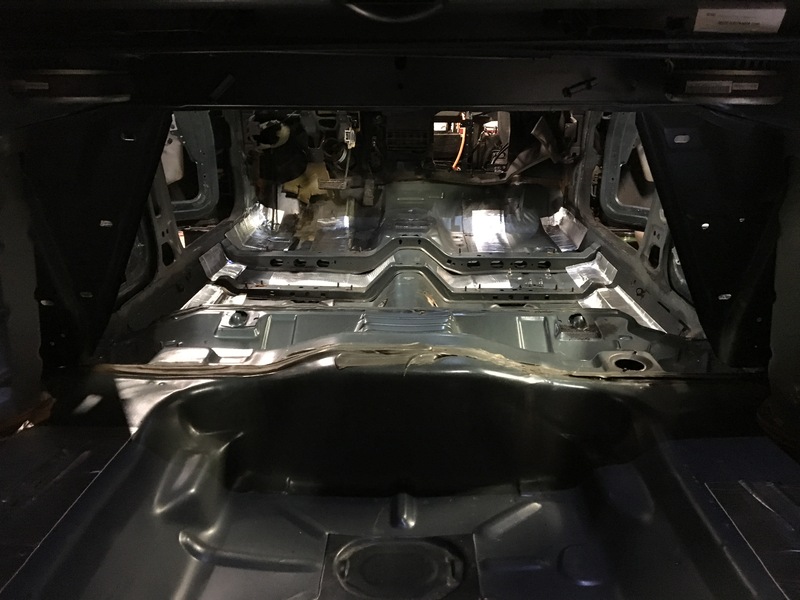 I've got one more spot in the joint between the wheel well and the seat pan area to fix, then this will all get sanded, degreased, and painted and undercoated. 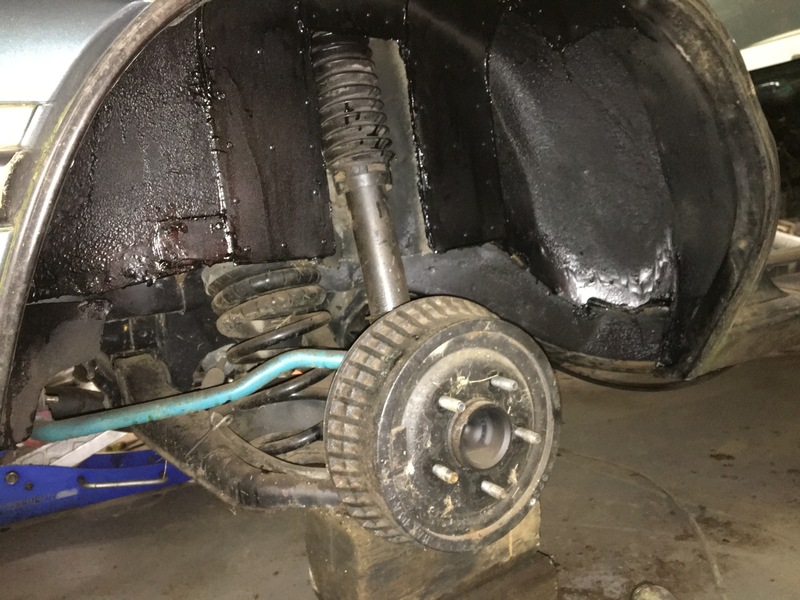 I still find it odd that this wheel well had an issue, but the others don't. I'm guessing something chipped through the factory undercoating at a seam and it just soaked in the water/salt over the years. 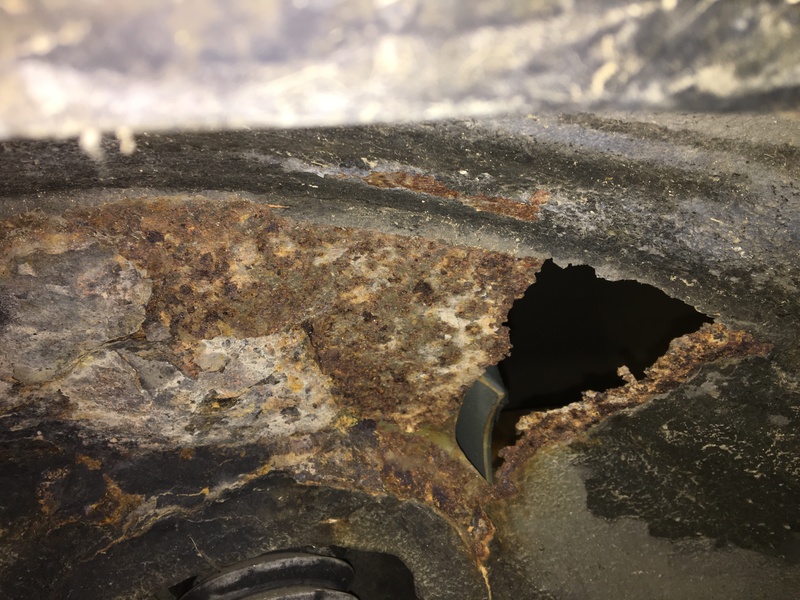 After that was done I went over to the other side, where just looking at it from the outside you couldn't tell there was a rust problem in the wheel well. This is just high enough to hold water, and in direct line of spray from the tire. That's this mystery solved... Anyhow, time to break out the angle grinder and see what we can find! 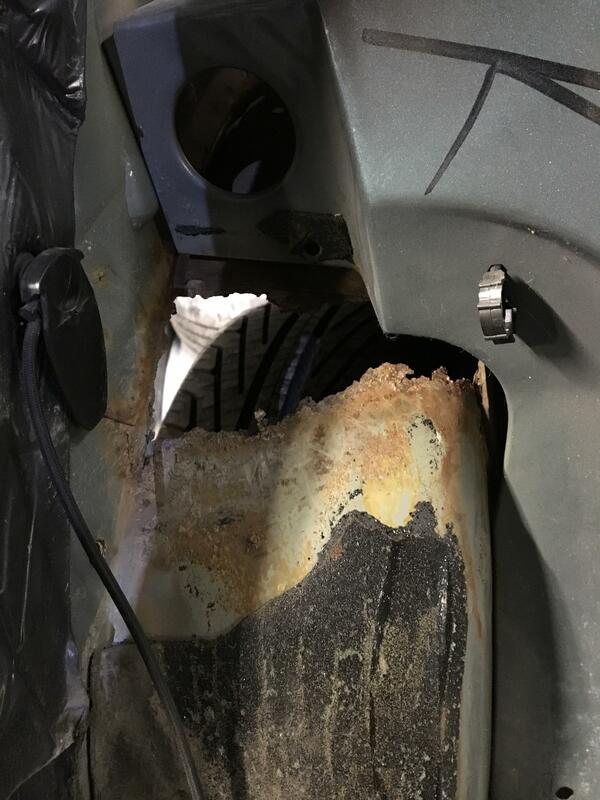 We've got some rust starting at the top where the undercoating was failing, it's just starting so stopping it now means the upper wheel well area won't need patch panels. 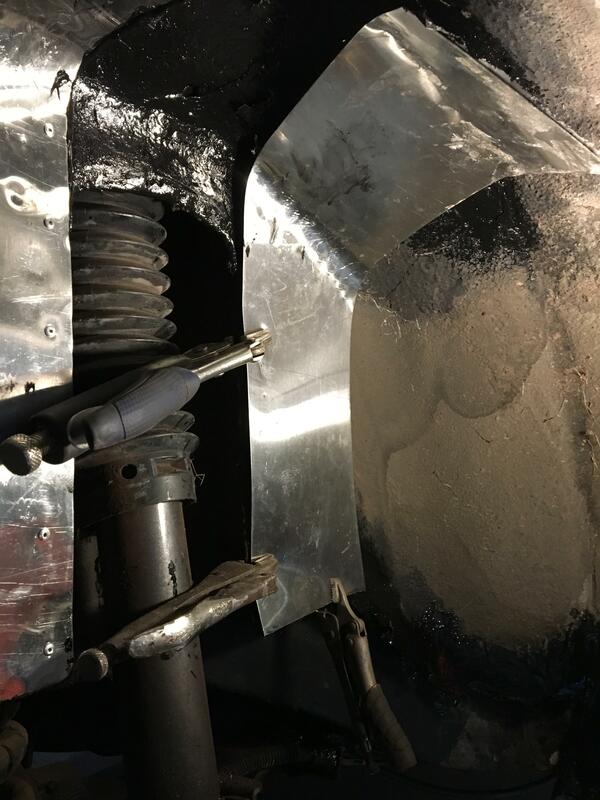 But the pinch weld between the seat pan and the well panel also saw undercoating failure, and of course those weld flanges hold moisture and it wicks in there pretty deep. That combined with the spray inside the dogleg makes the seat pan look pretty bad. 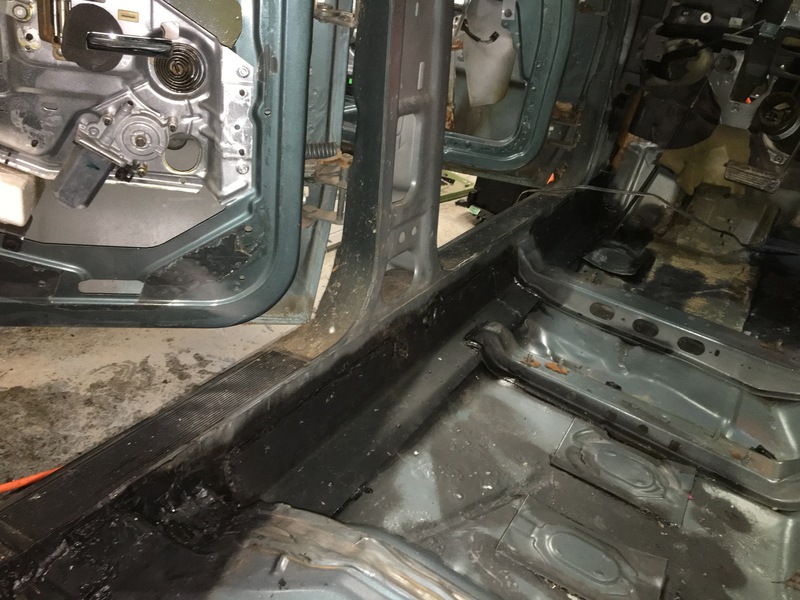 It's soaking in evaporust right now, including inside the frame rail. I'm probably going to send the boroscope in there just to see if I can find anything else interesting, but it's otherwise ready to get a coating of POR15. Anyhow, that took about 30 minutes to get it back into the cowl..